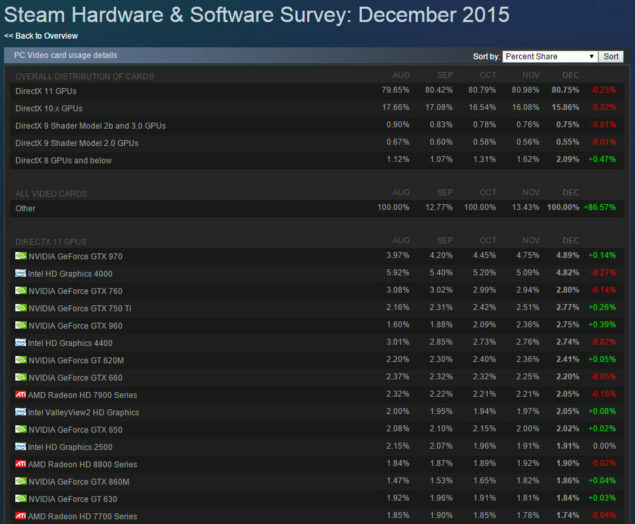 Steam has updated their hardware survey page as of December 2015 and revealed an interesting development. For some time, we have known that NVIDIA has dominated the discrete graphics market with a share around 80% and AMD’s share standing around 20%. The Steam hardware survey page gives a glimpse of the market as it shows which graphics cards are selling well and most popular among PC gamers. Since it’s arrival back in September of 2014, the second generation Maxwell graphics cards became the popular choice for gamers around the globe. This was witnessed just four months after the launch of the first Maxwell (2nd generation) cards when it was reported that NVIDIA had sold over 1 million Maxwell based cards. 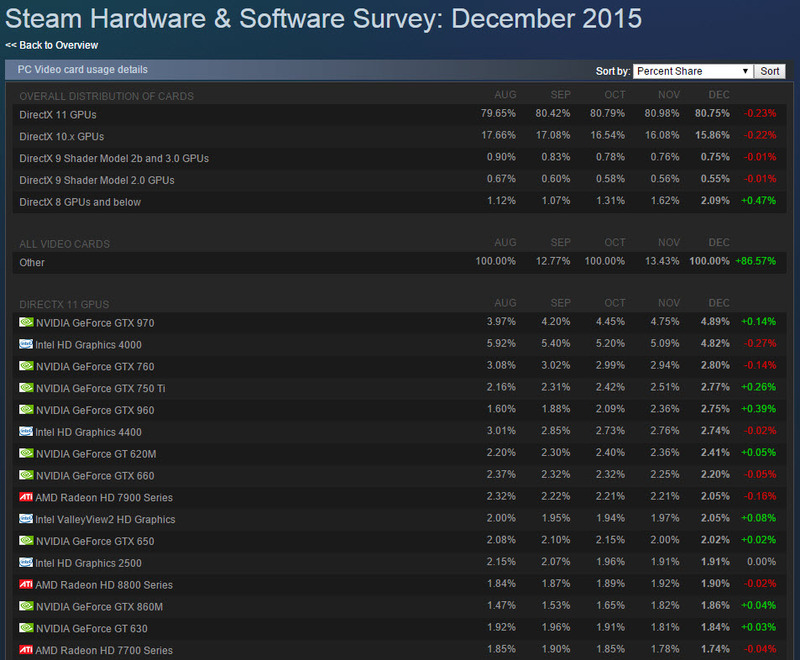 Steam has been updating their hardware survey page for quite some time now and the most recent update came in December 2015 which shows that GeForce GTX 970 has become the most popular and the most widely used graphics card among PC gamers with a user base of 4.89% in December, up from 4.75% in November. The GTX 970 was among the two GM204 graphics cards launched back in 2014 and has climbed the top of the ladder in Steam’s hardware survey as the most used graphics card. Surprisingly, the GeForce GTX 970 even went past the HD Graphics 4000 GPU from Intel as it sees a monthly decline, indicating that most PC users (including casual and mainstream audiences) are now shifting away from integrated graphics cards in favor of discrete graphics cards. Almost every iGPU has seen a decline as shown in the hardware survey and is expected to continue as graphics cards become more powerful and mid-range hit the sweet-spot pricing. 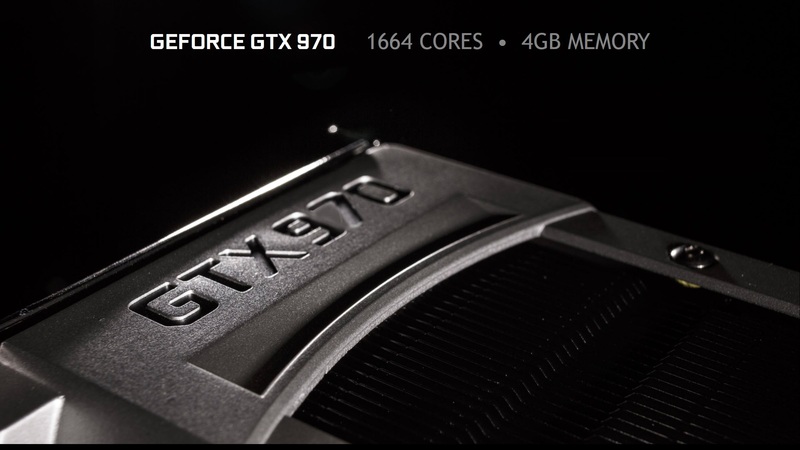 More users going towards the GeForce GTX 970 as a gaming option shows the confidence of users in NVIDIA even after the whole 3.5 GB memory fiasco that surrounded the GTX 970 earlier this year. The GeForce GTX 970 now indeed comes with a memory partition but the performance in games don’t get impacted much and due to the ever decreasing price of the GTX 970 (now around $299), it’s seen as a good option for gamers who want to enjoy AAA titles on 1080P resolution and beyond that. Plus, the GTX 970 is already confirmed to be the minimum requirement for Virtual Reality and it will get added support for next-generation titles thanks to the NVIDIA GameWorks program. Talking about mid-range, NVIDIA’s GeForce GTX 760 still remains at the third place in the list however is now seeing a decline as it’s over two years old. The focus of attention is now diverting to the GeForce GTX 960 that has bagged the fifth spot in the top used graphics cards and witnessed the largest increase in number of users going for the mid-range card. The card’s usage grew by 0.39% amounting to 2.75% of the entire Steam user base that now owns the graphics card. The second biggest increase was seen on the GeForce GTX 750 Ti which has also seen popularity among users in the Asia Pacific region as entry level users don’t need to add a beefy PSU to their PCs to make the card run as it relies on just PCI-e power (60W TDP). Surprisingly, none of the recently launched Radeon 300 series showed up in the list. The Radeon HD 7900 series cards are still the most popular cards among the Steam user base amounting to 2.05% of the gaming audience however it is slightly declining with the share now dwindling down to 2.05% which is a 0.16% decline from 2.2% in November 2015. However, not all is bad with AMD’s lineup as their Radeon 200 series cards saw a 0.12% increase in December with 1.57% of the Steam user base now running a last generation GCN based graphics card owing to their low price and being sold for nickels in the used market. The Radeon Fury and 300 series not showing up in the list is shocking however the Radeon R7 300 series did pick up some boost with an increase of 0.07% in December. Summing it up, the total share of graphics chips (discrete and integrated) include 54.61% of NVIDIA based GPUs, 26.33% of AMD based GPUs and 18.66% of Intel based GPUs. The remaining 0.5% are from different vendors which include Matrox and SiS. In another list, the number of PCs running Windows Vista, Windows 7 and Windows 8 have seen a huge decline as majority of users migrate to Windows 10 (64-bit) OS that offers DirectX 12 support which is supposed to be a game changer for the gaming industry. The Windows 7 OS still has a share of 36.49% but is on a constant decline since the launch of Windows 10. The latest OS has a share of 32.76% and seeing a huge increase, month after month. Windows 8.1 is also facing a constant decline due to emergence of Windows 10 and amounts to a share of 15.82%. It seems like NVIDIA has quite the grip on the gaming market with their Maxwell cards however it’s their responsibility to provide the large user base with good and long term support. NVIDIA is expected to launch their Pascal graphics cards soon which will offer increased graphics performance to gamers and adding better support for next-generation experiences such as Virtual Reality.